This blog was originally posted on The Learning Accelerator’s BlendED Blog. In education, we have a tendency to reinvent the wheel. At its core, the challenge is not a lack of will to share; rather, our public education system isn’t built for sector-wide collaboration. Instead, it decentralizes structures and policies, leading to the unintended outcome of a hyper-local system. While adapting content to local contexts is always important, our inability to share universal high-potential practices cripples our system from effectively scaling the strategies that will ultimately move the needle for students in our country. If we want to progress as a sector, we need to do less recreating and do more sharing and learning from others in order to leapfrog and accelerate the adoption of high-potential practices. Absent the overturning of the current hyper-local system that we operate within, we can only get there by coalescing and developing the infrastructure to support collaboration. And so, in order to scale transformational teaching and learning practices, we need to start by sharing and collaborating around how we develop our educators. The Learning Accelerator (TLA) is engaged in two key projects to weave the fabric for professional learning: Learn Next and The Learning Commons. Learn Next: a collaboration to build and scale professional learning courses for transformative learning. 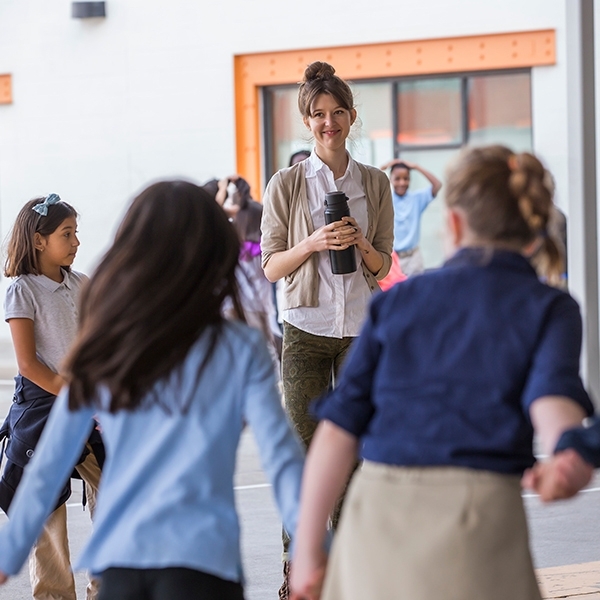 After identifying the need for more collaborative efforts, 2Revolutions, a national education design lab striving to transform the American education system, launched Learn Next to build the field’s capacity to personalize learning in schools. Partnering with numerous expert organizations, they built free and open professional learning resources organized around its building blocks for transformative teaching and learning. With learning progressions, playlists, and courses, the collaborative developed a scaffolded and self-paced professional learning experience to support educators in shifting their practice. Through this collective effort, education leaders and experts across the field have joined together develop shared resources for the field. Rather than (re)creating these resources individually, the group of organizations is standing together, coalescing around high-quality practices and resources, and sharing this set of tools to support schools in advancing practice faster. The Learning Commons: a coalition to make professional learning content and data interoperable. Another key issue holding back the sector is the lack of infrastructure for finding and sharing professional learning content. Organizations spend time (re)creating resources for educators, but they struggle to get the resources into the hands of educators. Meanwhile, educators lack the tools to discover and access high-quality content, limited to search engines that are too vast and imprecise. To bridge this divide, TLA partnered with Yet Analytics and many other leaders in the professional learning space to create The Learning Commons, a shared site that makes content searchable and portable for educators. By connecting content from over 18 partner organizations — including those of Learn Next, The Learning Accelerator, and others — we’ve made content modularized, allowing educators to find and even package content from multiple organizations into playlists around common themes, such as personalized instruction. Instead of recreating resources and frameworks for educator competencies, we are partnering with organizations to connect how we map our content and the resources themselves. With The Learning Commons, we are developing the infrastructure for sharing resources across organizations and schools, ensuring education leaders can find and adapt great professional learning content and avoid wasting time recreating it themselves. Through both of these efforts, we are making content free and open and developing structures for personalized professional learning. And by building coalitions and leveraging collective knowledge, we can lay out the groundwork for sharing and collaboration, reducing the time wasted on duplicative efforts. Ultimately, this work will help us close the opportunity and achievement gaps for students more quickly. Stephen Pham is an associate partner at The Learning Accelerator, an experienced educator, and a proponent of blended and personalized learning. Follow Stephen on Twitter @stephenqpham.